This is one of those meals where it’s “how many of these are too many before I start to get judged?”… haha. I literally loved these and ate them the next day for lunch as well. They are so flavorful and cheesy. For me, it’s important to be able to make food quickly and this took me under an hour – I love italian food and this is definitely going to be a go-to recipe for me. Try it! Preheat the oven to 350 degrees. Place a large pot of water with salt to boil and cook shells per package instructions. I would boil until pasta is soft but still a little al-dente. Meanwhile, In a medium size bowl, combine the ricotta, dice the mozzarella and add half of it, the parmigiano reggiano, parsley, salt and pepper (use your best judgement, enough to add flavor) and mix to combine the filling. 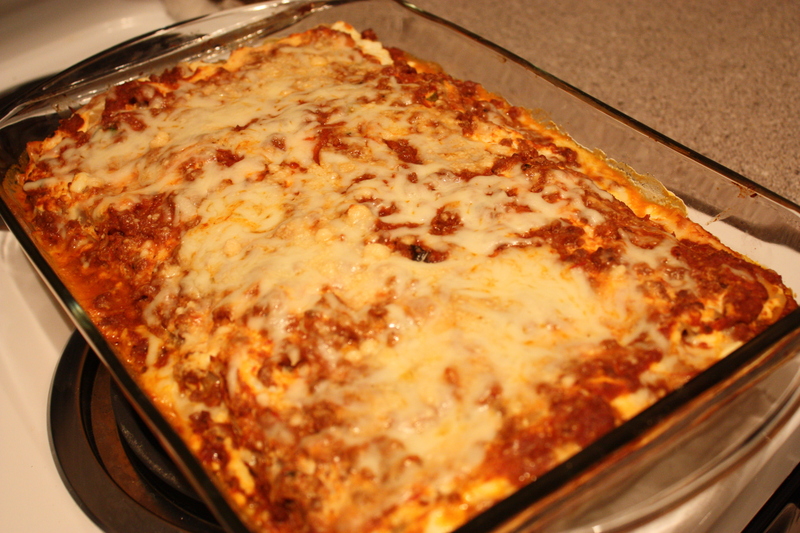 On the bottom of a large baking dish, spread half the pasta sauce on the bottom of the pan to coat evenly. Once the pasta is cooked, drain. 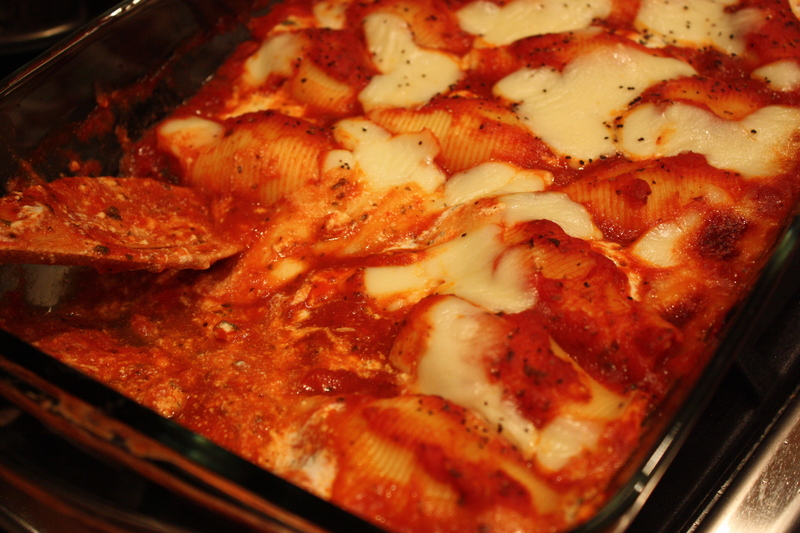 One by one, stuff each shell with the cheese mixture and set on it’s side in the pan right on top of the sauce. Repeat until you run out of space in the baking dish. 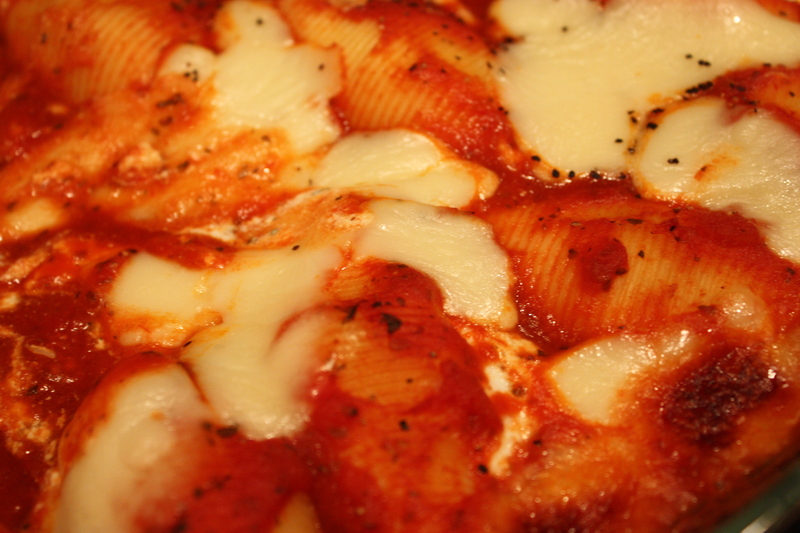 Sprinkle the rest of the pasta sauce on top of the shells and top with the rest of the diced mozzarella. Add pepper to top and bake at 350 degrees for 15-20 minutes or until the cheese is melted. In my photo below I probably should have left it for a few more minutes but either way it came out good (I love the texture of chunky mozz pieces)! 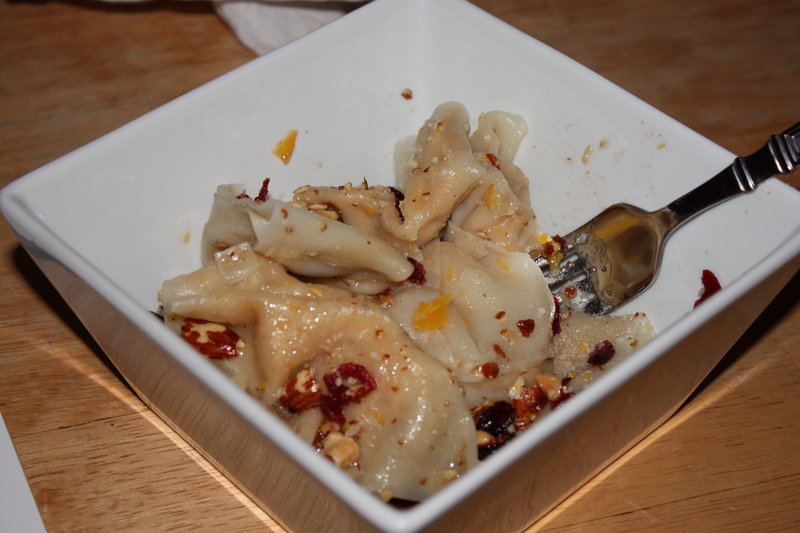 These don’t photograph well but they were really good! 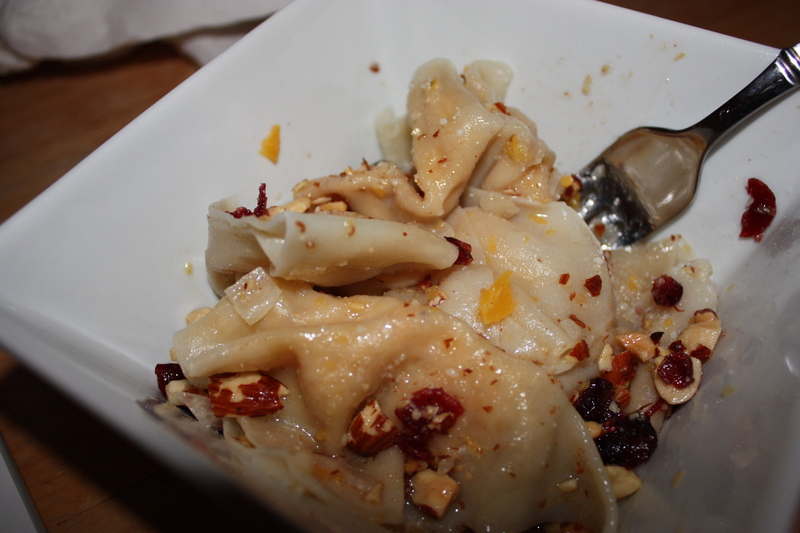 I saw this recipe on the food network, one of Glada De Laurentis’s recipes. It looked so good in the pictures and the idea of making my own tortellini was challenging and exciting because i’ve never done it before. It was actually a really easy recipe! If you have the time to stand and make countless tortellini, its worth the effort. To make the tortellini, preheat the oven to 375 degrees F. Line a baking sheet with foil and toss together the butternut squash, 2 tablespoons of olive oil, herbs de Provence, salt, and pepper. Now you’re probably thinking, what in the world is Herbs de Provence? Well, its a mixture of herbs commonly used in french cuisine. I found an awesome Herb de Provence Vinagrette in Publix, used it instead, and the pasta came out equally as delicious. Bake in the oven until soft and golden, about 25 minutes. Meanwhile, heat the olive oil in a small saute pan over medium heat. 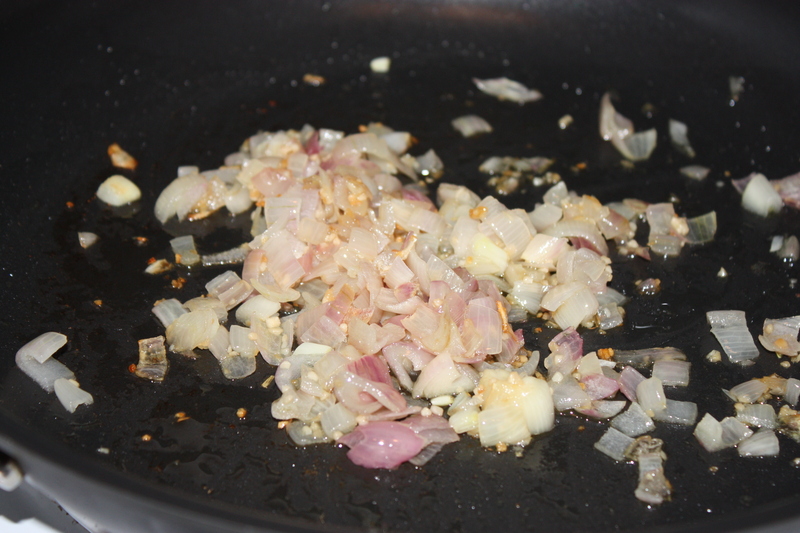 Cook the shallots and garlic until lightly golden, about 3 minutes. In a food processor, combine the butternut squash mixture, the shallot mixture, and the ricotta cheese and pulse a few times to blend. Add the crushed amaretti cookies, the nutmeg, and sprinkle with salt and freshly ground black pepper. Pulse until smooth. 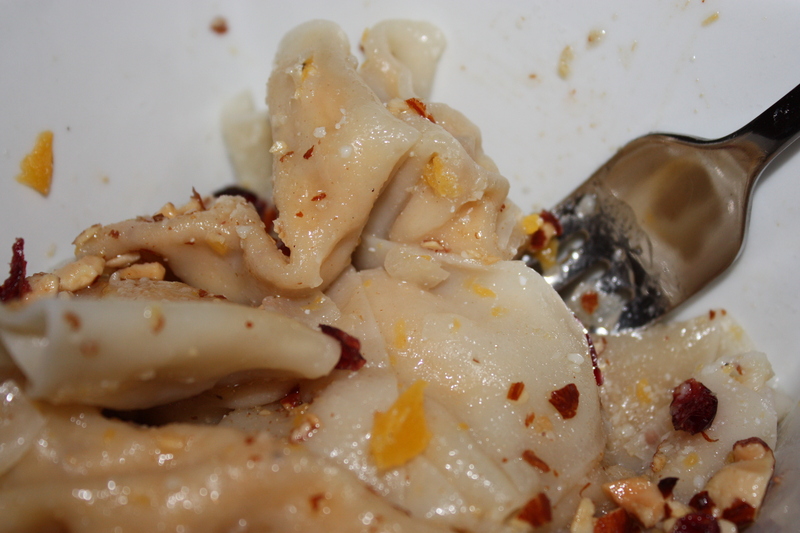 The tortellini filling can be made one day ahead. 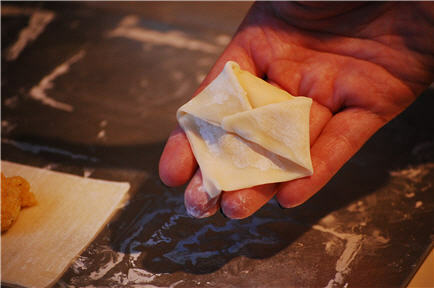 To make the tortellini, lay out wonton skins, keeping the remaining skins inside the package or under a very lightly dampened paper towel. Place 1 tablespoon of squash mixture in the middle of each skin. Dip a pastry brush in a little water and wet the edges of the skin. Gently fold the square wrapper into a triangle, making sure the edges are securely closed and there are no air pockets inside. Dampen the two bottom corners of the longest side of the triangle and gently bring them together, pressing lightly to secure. Continue until all the butternut squash mixture is used. To complete our pasta, bring a large pot of salted water to a boil. Meanwhile, melt the butter in a large, heavy skillet over medium heat. 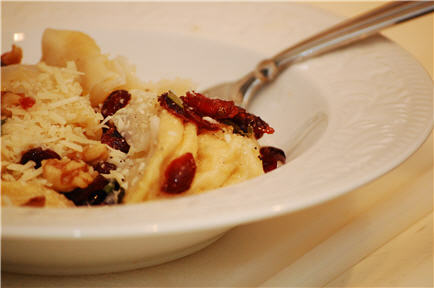 Add the sage, walnuts and cranberries and let cook until the butter starts to brown, about 3 minutes. Turn the heat off and season with salt, and pepper. Then, gently place the tortellini in the boiling water and gently stir. When they begin to float they are done, about 3 minutes. Using a slotted spoon, gently spoon the tortellini onto a serving platter, Top with the brown butter sauce, sprinkle with Parmesan cheese and serve. Easy… and enjoy =) I know we did! Preheat the oven to 350°. If you haven’t already done so, in a skillet cook the ground meat. Drain the oil from the skillet and pulse the pieces of meat in a food processor to make smaller pieces. In a medium bowl, empty the sauce and add the meat. In another bowl, mix the ricotta cheese, egg, and oregano. Shred the pound of mozzarella cheese and set aside. 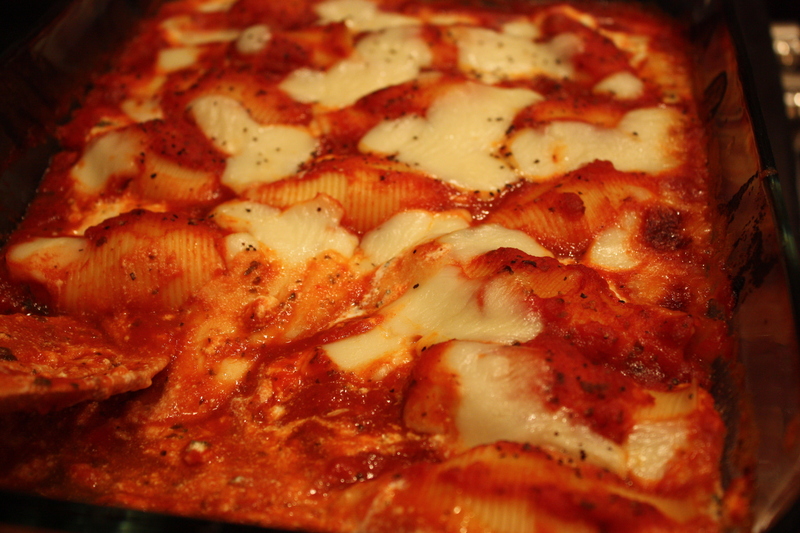 In a 13″ x 9″, put 3 pieces of pasta down on the pan. Cover it in the ricotta mixture. Then the meat sauce mixture. 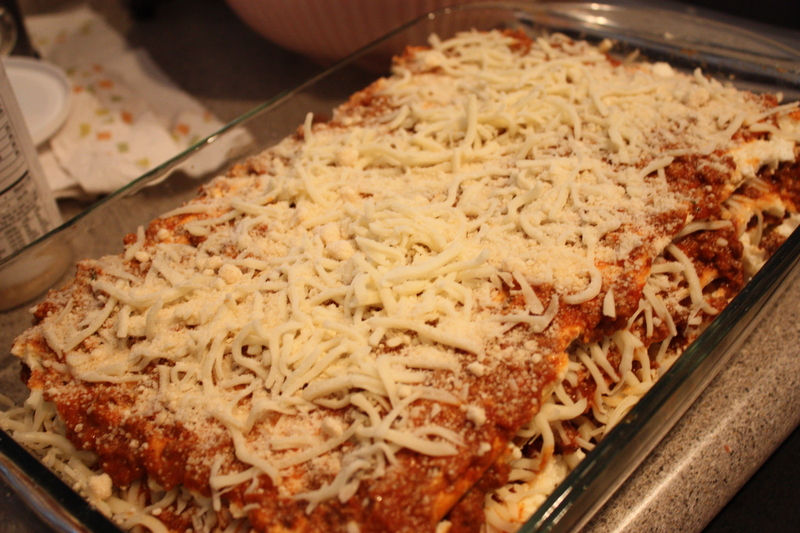 Finally, spread grated cheese. Repeat this step 3 more times. 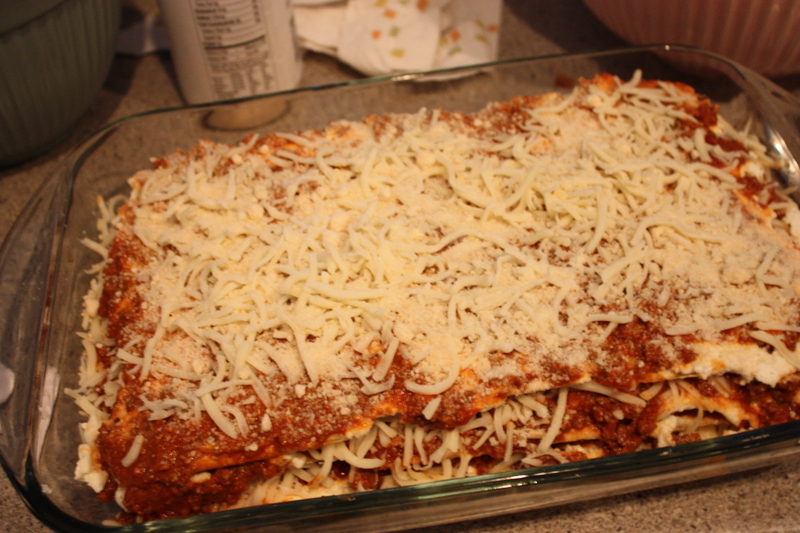 On the fourth layer, ONLY put the 3 pieces on the top with the meat sauce and the mozzarella. Add the cup of parmesan cheese. Cover the pan, and let it cook in the oven for 30 minutes. 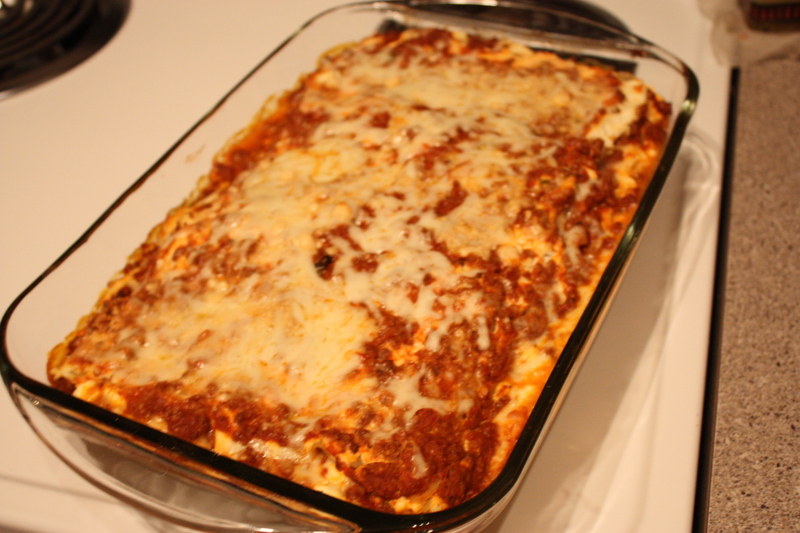 After 30 minutes ends, uncover the pan and let it bake for another 15 minutes so that the cheese is bubbling and it looks delicious.